Plot: Set in Britain, Willy Russell’s Blood Brothers tells the story of fraternal twins who are separated at birth. One brother is raised in a family of great privilege and one brother is raised in poverty. Even with their different socioeconomic backgrounds, the two boys end up becoming best friends until a misunderstanding leads to a tragic ending. I did mention here that I nearly missed out on Blood Brothers because I don’t know anything. It’s true, I really dont know anything. I passed judgment without even checking what it was about and it wasn’t until Melanie C took over the main role as Mrs Johnstone that my interest was piqued. 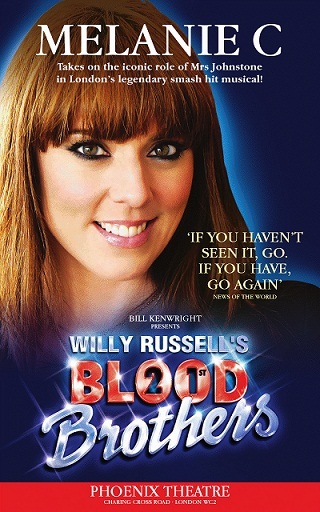 I asked myself why would Melanie C, the artist formerly known as Sporty Spice, be attracted to this musical and then of course the critics were all unanimous in their verdict, now there is this renewed interest for Blood Brothers. Most of the accolades were directed to Miss Chisholm’s outstanding performance and after seeing it last night, I raise my hand, okay both hands even, and say that I was completely blown away by this musical. I absolutely love it and after Hello Dolly!, it’s the second musical I enjoyed this year, and will probably be my new Phantom of the Opera, in my language that means, I am most likely to see it more than once. It’s got everything going for it, a good storyline, interesting characters you will care for, a smashing score and an excellent casting ensemble. Mel C didnt disappoint, she had you at the palm of her hands from the start. Her scenes with either of the twins was tender and heartbreaking as the situation calls for it, and her songs! Easy Terms was haunting and Tell Me It’s Not True emotionally charged. It’s that kind of musical that will make even the most hard hearted choked with emotions. I bawled like I’ve never bawled before, tears freely streaming down my face that I had to control myself and not scream BRAVO at the top of my lungs. We gave the cast four curtain calls and a standing ovation. Very special mention to Philip Stewart as the narrator whose singing of The Devil’s Got Your Number made it sound even more ominous, the twins were portrayed really well by both Stephen Palfreman as Mickey and Richard Reynard as Eddie. Their songs My Friend and That Guy were just two of the loveliest ditties about friendship I have heard performed on stage. If you have seen Blood Brothers, good on you, but why not see it again though? And if you haven’t seen Blood Brothers, I implore you, please don’t do a Simone and pass judgment quickly, check this out, it’s definitely worth the ticket. I am telling you, it’s true. Pun intended.